We are entering our third week of Lent. 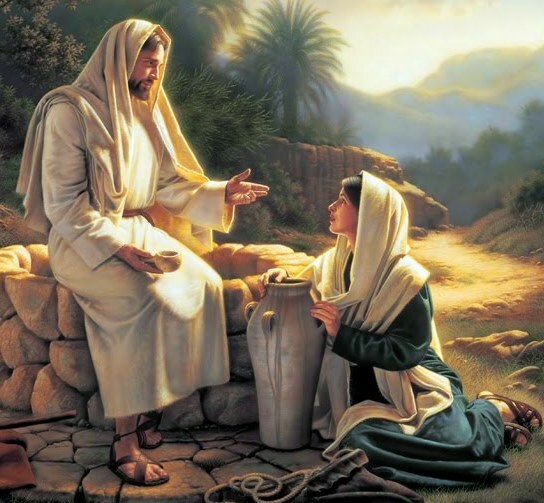 This week the Church gives us the story of the woman at the well. Let us contemplate two hearts. The heart of Jesus and the heart of the woman. Jews did not deal with Samaritans. Jesus’ heart felt for her. He begins a simple, yet profound, conversation with her. His heart goes out to this woman. He sees that her heart is good. She is seeking love, affection and security in the wrong places and with the wrong people. Jesus knows this. He sees her heart. Two hearts, each different, each seeking love. Jesus draws her out so He can reveal himself to her as the Messiah. Ponder the two Hearts. Is Jesus seeking after me during this third week of Lent? Can I be open to the loving heart of Jesus? What is Jesus asking of me? What is Jesus revealing to me? Is my heart open to receive His love as was the woman’ heart at the well? Do I seek love and affection in the wrong places? Jesus, I place all my trust in you. This entry was posted in Reflections, Seasonal Thoughts and tagged contemplate, Jesus, Lent, Lenten season, Messiah, Samaritan woman, trust, two hearts. Bookmark the permalink. This is beautiful – so soul searching and so reflective for me and surely for all who read this blog. Thanks, Madeline. It reminds us who MHSH are, “Hearts touching hearts”.